architecture. Thalli of Wengania globosa are broadly spherical, nodular, or irregular, 70-750 pm in diameter in thin section, and display a simple pseudoparenchymatous construction (FIG. 4.53) , in which cortex and medulla are not differentiated. The thalli consist of cuboidal cells that form regular files, radiating outward and branching toward the thallus margin. In W. exquisita, cell files are less regularly arranged, whereas in the third species, W. minuta, regular cell files are absent (Xiao, 2004). Similar simple thalli are formed by Thallophycoides pholeatus and Gremiphyca corymbiata ( FIG. 4.54 ). These thalli may be lobed, however, with the most profound lobation occurring in G. corymbiata. Thalli of Thallophyca ramosa and T. corrugata (FIG. 4.55) display a complex pseudoparenchy-matous construction, in which there is a clear differentiation into an inner medulla and outer cortex (FIG. 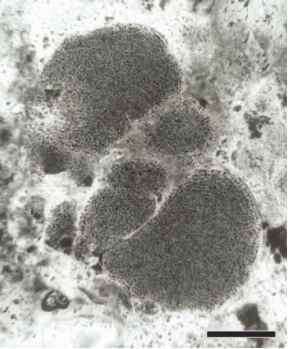 4.56), with cortical cells either smaller than the medullary cells or arranged differently, and clustered cell islands interpreted as reproductive cells (Y. Zhang et al., 1998). 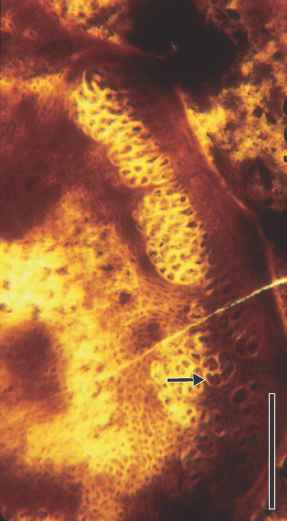 The pseudoparenchyma is arrayed as upward diverging splays of filaments or cell fountains. Diverging filaments form fan-shaped lobes separated by deep invaginations. Particularly striking are cylindrical, cell-lined invaginations that resemble conceptacles. Thalli of Paramecia incognata are millimeter-sized nodules characterized by cortex-medulla differentiation, thallus compartmentalization (FIG. 4.57), and absence of well-developed invaginations (FIG. 4.58). Xiao et al. (2004) stated that the complex pseudoparenchymatous thalli of Thallophyca and Paramecia display features resembling those seen in some Paleozoic members of the Corallinales, and thus these forms may be interpreted as stem group corallinaceans. They are clearly different from the crown group corallines, however, in that they are not calcified in life (Xiao and Knoll, 1999). Saunders and Hommersand, 2004). Paratetraphycus gigan-teus has been reported from the Meso-Neoproterozoic (middle Riphean) in the southern Urals (Sergeev and Lee, 2006). (1994) noted that this structure may also resemble various red and brown algae. Enteromorphites intestinalis from the Early Cambrian Chengjiang Biota in southeastern China is a considerably larger (>7cm high) form, composed of hollow unbranched tubes that were attached to the substrate by a basal rhizoidal cell or tubular proliferations (Xu, 2001b). bryophyte. 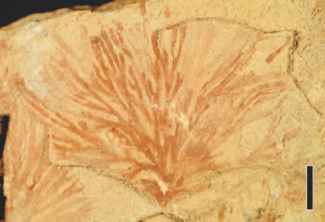 Another diverse early algal flora has been reported from the Middle Cambrian Kaili Biota in Guizhou Province, China (Yang et al., 2001). 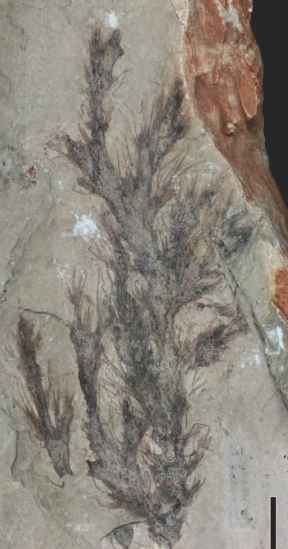 This flora consists of more than 20 genera, 5 of which have tentatively been assigned to the red algae, Palaeocodium , Paraamphiroa , Wahpia , Dalyia , and Bosworthia. Thalli of Paraamphiroa siniansis are <1.5 cm high and composed of a main branch that distally produces a cluster of second-order, bi- or trifurcating branches, each consisting of uncalcified joints and calcified, cylindrical segments. 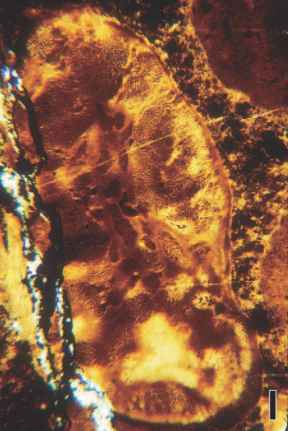 This alga is believed to represent the earliest fossil evidence for a calcified red alga (Yang and Zhao, 2000). 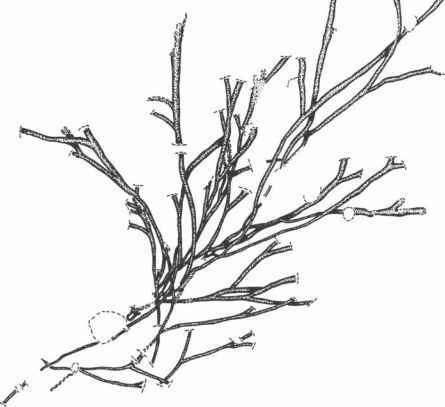 which in turn bear a profusion of smaller branches and terminal filaments (Briggs et al., 1994). Several extant red algae possess morphologies that are similar to the Late Ordovician alga Manitobia patula. In this form, the laminar thallus divides in a single plane, with each segment further divided into three, nearly uniform segments. 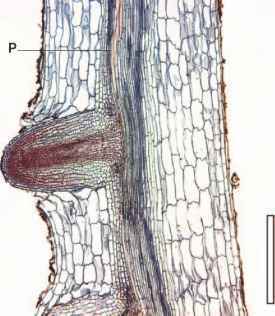 The margin of the thallus is entire, and the apex of each segment typically truncated (Fry, 1983). Three macroscopic Devonian algae occur in marine rocks in New York (Fry and Banks, 1955). Drydenia (FIG. 4.67) consists of elliptical laminae (8.5 cm long) that are basally attached to a narrow stipe terminating in a branching holdfast. In Hungerfordia (FIG. 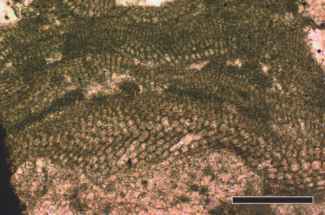 4.68), also recorded from the Late Devonian of South Africa (Hiller and Gess, 1996), the lamina is highly dichoto-mous with the distal segments lobed. Specimens of Enfieldia are circular (5.0 cm in diameter), with the outer margin lobed, and characterized by distinct reticulations. Both Drydenia and Hungerfordia have been compared with existing red and brown algae; Enfieldia is more difficult to position systematically, perhaps representing a thalloid liverwort. The genus Perissothallus (FIG. 4.69) comprises several types of uncalcified macroalgae from Late Pennsylvanian and Early Permian freshwater environments of North America and Europe. 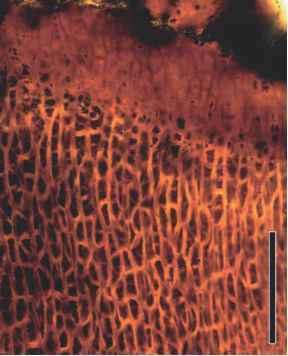 The thallus consists of repeatedly dichotomizing, erect cylindrical branches that radiate from a small holdfast (Krings et al., 2007d). Vegetative reproduction occurs in the form of secondary thalli produced on prostrate branches. Striking similarities in basic structure exist between Perissothallus and members of the extant marine red algal genus Scinaia (Nemaliales), but the fossils superficially resemble species of the extant genera Codium (green algae) and Dictyota (brown algae). 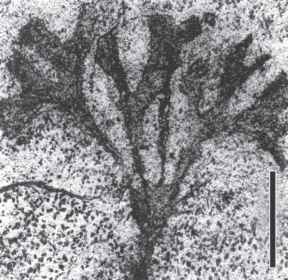 Another putative late Paleozoic red alga consists of a central axis with nodes of lateral appendages (FIG. 4.70 ). 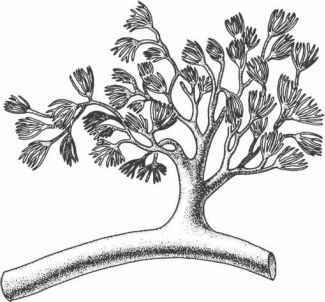 FIGURE 4.69 Perissothallus showing branches radiating from holdfast (Pennsylvanian). Bar = 1 cm. 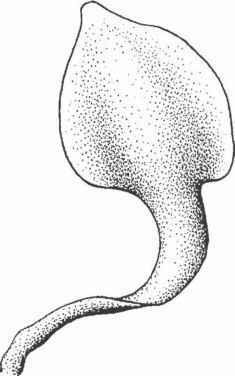 FIGURE 4.70 Grateloupia sp. (Permian). Bar = 2 cm. Australia and Tasmania (Krings and Mayr, 2004). Another red alga from the Haqel fish beds is Delesserites lebanensis (Basson, 1981). This compressed, Delesseria- like thallus is ~9.5 cm long and includes several blades that radiate from a common stipe (FIG. 4.72). Nothing is known about the holdfast or reproductive organs of this alga.